Par Wall is a powerful storage system due to its ability to create storage density in a variety of applications. Storage components are attached to a wall using louvered panels or slotted wall strips. A freestanding frame is also available. The baskets are interchangeable between the structures. As the name suggest we have designed a Par Wall shelving unit on traditional posts and casters. These units have been designed after our classic ParWall fine mesh system with all the benefits. We have increased the size of the baskets to accommodate the high-volume items you may have in your supply areas. With the addition of a slanted top basket you know can now use this space for storage. Sizes range from 24” wide to 60” wide and 18” deep to 24” deep for your high-volume storage needs. Our New Lean Wall, Par Wall basket mounting system give you the versatility of adapting to those hard to fit rooms for storage with all of the benefits of the high-density fine mesh baskets. The longer design of the uprights allows more capacity than a standard Louvered panel system and you can slant the top baskets. Lean wall was designed to work around most wall mounted obstacles so you can utilize the space more efficiently. Classic Par Wall is a fine mesh high density storage system that can be configured on a stand with 7 tiers for maximum storage capacity. Using our easy adjust snap in divider system make right sizing your lanes a quick and easy. Baskets are 12” and 18” deep and come in a variety of widths to meet the needs of your given space. Par Wall for louvered panel is used for wall mounting Par Wall baskets. These baskets comes in sizes of 18", 36", and 48" in depths of 12" and 18". The nominal size is 1/2" bigger than the actual size. This is our highest-density storage system with a broad range of capabilities and storage options. 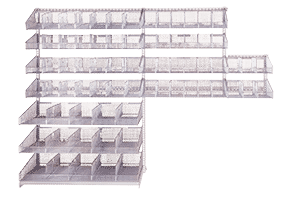 Each unit can be configured with shelves, baskets, trays or combinations of all of these. All accessories are on full-extension slides to maximize visibility and accessibility. With accessory height adjustability in 1-inch increments, Par Stor puts every inch of vertical space to work. Par Stor is an essential storage solution where space is at a premium and maximum product compression is required to hold all necessary products. 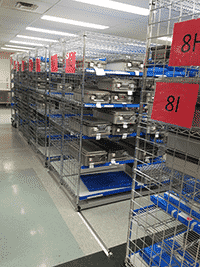 Par Stor Modules utilize every square inch of vertical storage space. A single unit can hold up to the same amount of products as a typical 24 x 60 shelving unit. When a large amount of product needs to be transported throughout a facility, Par Carts offer all the features of the Par Stor modules in an all-welded, highly-mobile platform.